1. Launch the DPS. GP Agent will mark all tasks that were scheduled to run on this DPS. If you are running multiple instances of the DPS, each instance will need to be launched and each instance will take care of marking its tasks. 2. Launch Dynamics GP. After you login, GP Agent will look for tasks that were scheduled based on the User ID. 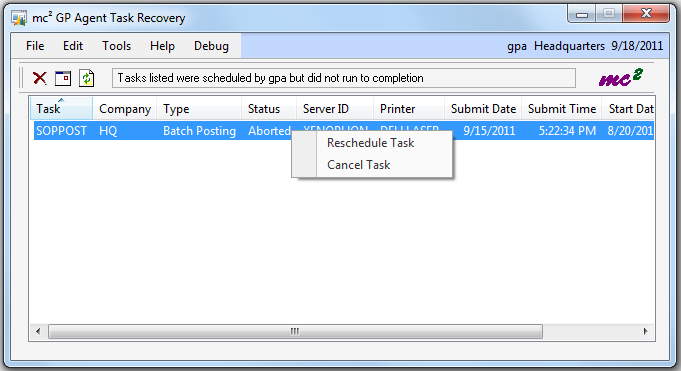 Any tasks that had been scheduled by the user will be flagged and the GP Agent Task Recovery window will automatically open. If you reschedule them, the task will use the same settings as when it was originally scheduled, including any tasks that were scheduled to run in multiple companies. This means that a task that had been schedule and did not run as expected might start running immediately. If you cancel them from this window, you can go to the Scheduled Task Maintenance window and schedule them again.